We are most grateful to our sponsors. Please click on this logo to see the list. We are pleased to announce that the 2002 San Felix Island Expedition was carried out on schedule and on budget. The volcanic island surprised us: it was bigger, blacker, rockier, and dustier than we expected. We helicoptered in several tons of gear, including all life support for 12 men for 2 weeks. Three separate sites for radio operations were set up, each with 2 radios and a variety of antennas. The sites were on bluffs overlooking the ocean, on the north side of the island, with most of the amateur radio community between northeast and northwest. XRØX came on the air at 1748Z on 15 March 2002. The first station logged was Ricardo, CEØYWS. During nearly 10 days of operations, the team of 12 logged a total of nearly 68,910 radio contacts on all amateur bands 6-160 m, and all modes SSB, CW, RTTY, and PSK. Radio operations concluded at 1415Z on 26 March 2002. The last station logged was W8WFN. We are especially proud that there were very low rates of interference, pirates, and duplicate contacts. At times, we had 6 stations operating simultaneously, with no interstation interference. The logs were uploaded by satellite daily to the public web server. Here's a quick way to find out if you're in the XRØX log: just type in your callsign and click Search! Am I in the XRØX log? In addition to the radio operations, we were able to make a collection of rare plants and invertebrates, in collaboration with several major museums. One of the plants, shown here, is endemic to San Felix: it lives on this island, in an area of about one acre, and nowhere else in the world. 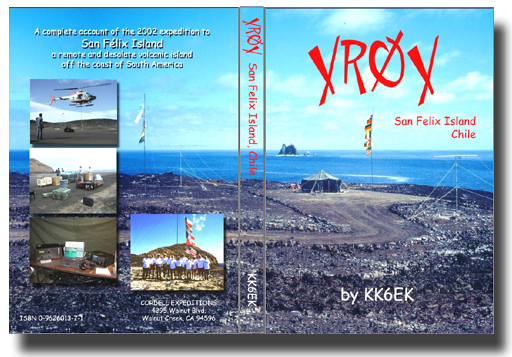 A printed book containing a narrative and the full data of the DXpedition, and including a CD with many photos, videos, and a log server, is in preparation (publication May, 2002). This will be the fourth in the series of 3YØPI, XRØZ/Y, VKØIR, ..., written by KK6EK.